Back when the first DJ Hero released, music games were at a cultural high, selling hundreds of thousands of units; games like Guitar Hero and Rock Band proved that peripheral-based music games could not only work, but be very profitable. However, when DJ Hero actually made it to store shelves, people were turned off by the high price tag and limited gameplay. For all intents and purposes, the general attitude was that the game was a flop. Except it wasn't. Just last month, it was reported that DJ Hero had 1.2 million units sold. It makes sense. The game has been available on sale for months now, making it a much more appealing game to people sick of the fake rock lifestyle that Guitar Hero and Rock Band offer. With 1.2 million units out in people's hands, it would be nice to see them using that turntable for more than just the one title and a couple of downloadable music packs. And so struts in DJ Hero 2. Announced officially in June, the game is nearing its launch this October. Activision offered us a few hours' time with the game, so hit the jump for our hands-on. 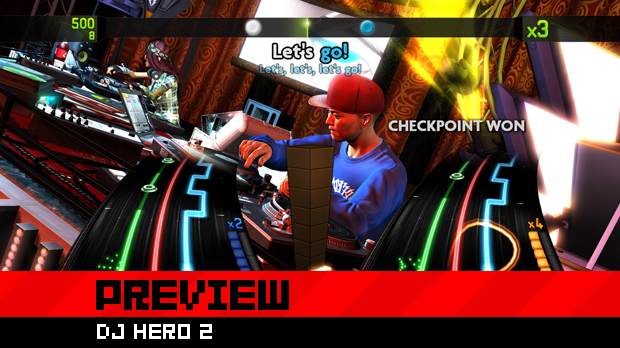 DJ Hero 2 follows the traditional music game sequel method of tossing in new songs on the disc. With artists ranging from Lady Gaga to Deadmau5, there is a broad spectrum of musicians whose work will be represented in the game. Supporting this is the single-player Empire Mode, in which the player works to be the leader of a music empire through mixing. Yep, it is nothing more than a single-player progression, but hopefully it'll be more interesting than the somewhat bland single-player mode from the first title. Also changed is the basic user interface. 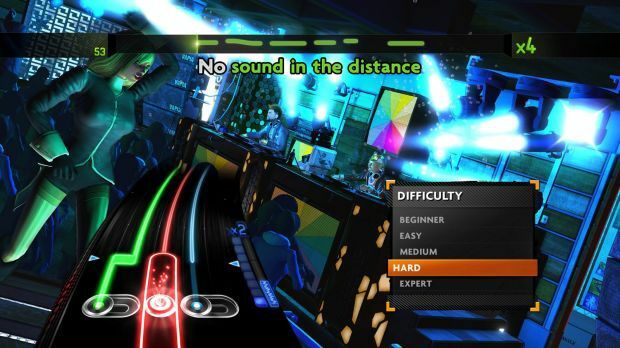 The overall layout and menu design is worlds better than the messy and confusing interface of the original game -- DJ Hero 2 has been outfitted with a clean, new, white interface and better-looking characters. In addition, it looks like the character models and animation have improved, with much more realistic dancing and mixing going on in the background. Gameplay-wise, there are a few more customization tricks for players. Remember the awful freestyle sample drops? It was an opportunity for players to toss sound clips into the middle of the song and freestyle. Unfortunately, they never sounded or worked very well. However, for DJ Hero 2, FreeStyleGames has made freestyling better, as you can perform your own spins, scratches and samples in a more harmonious and professional manner during the freestyle moments. Even more, players are going to be using the rewind ability much more often, and in multiplayer as well. It's a whole lot of little balancing that makes the musical experience better. Multiplayer seems to have received the most attention. People who have access to two turntables will be able to play newer and different modes. Quickplay, Pro-Faceoff, Accumulator, Checkpoints and Streak are all multiplayer modes for competitive players. I was shown the Accumulator mode, in which players have to achieve streaks of perfect timing before banking them into the score slot. With only a certain amount of banks, players have to be aware of their score, their combo, and when to slam on the Euphoria button. Pro-Faceoff is a traditional battle mode in which players play against each other, for the high score. For Party Play, there are a drop-in/drop-out options while the music just keeps playing. Streak is much like Accumulator, in which players try to pull off better streak combos through songs. Checkpoints is a point-based mode, where each song will be broken up into different segments and each segment can be won. The player with the most points wins. 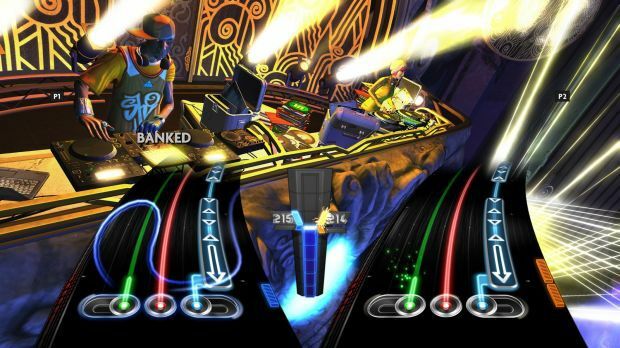 Considering Activision is selling a $149.99 two-turntable combo for DJ Hero 2, it's clear this game is all about playing on the couch together with some friends. [Edit: Activision will be offering two SKUs for DJ Hero 2 in addition to that bundle, at $59.99 for the standalone title, and $99.99 for the game and one turntable.] Also making a return is mic support for those who want to sing along. What has been improved is that now whenever they jump in, they will be scored on pitch and range. It's a nice addition, sure, and having three players able to play together is always a good thing. People who liked the original DJ Hero are going to find a lot to enjoy about this one. There are some new features, sure, but it doesn't look like it's going to change things up that much. The music mashups are as delightful and surreal as ever, and the game has enough changes to mean this is a much more polished experience overall.